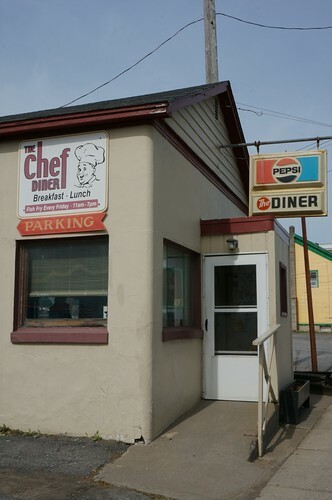 We checked out of the motel and decided to have breakfast in town at the local establishment, the Chef Diner. 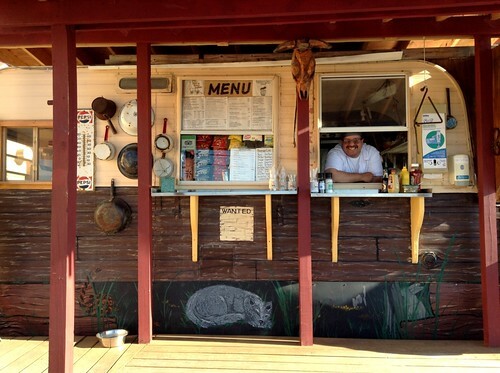 The food was very good and very plentiful here, as was the local conversation. 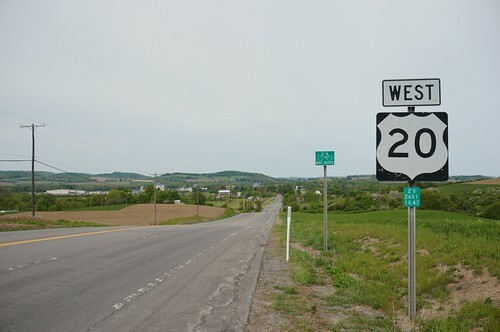 We continued west on US 20 throughout New York, and we quickly approached the Finger Lakes area, but not before passing through some nice country, with rolling hills. Seneca Falls was recommended by a friend to be a good place to spend a little time, a nice town with shops and restaurants, etc. But it turns out that there’s more to Seneca Falls! 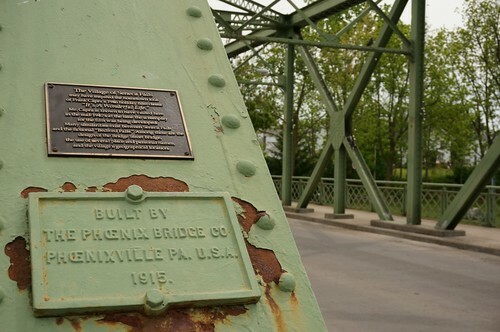 I remembered reading about this, but didn’t remember the name of the town or where it was, but once we got there, I found through my new Roadside America iOS app, that there was a bridge in town that was called the George Bailey Bridge. Filming location for “It’s a Wonderful Life” perhaps? No…not quite. Turns out that the town of Seneca Falls was visited by Frank Capra in the mid-40’s as the screenplay was being developed. There are many similarities between the fictional Bedford Falls and Seneca Falls, which they have noted at their website, the Real Bedford Falls. We didn’t have too much time to spend in town, but we did enjoy some gelato at a local Italian shop, and then a walk over to the George Bailey Bridge (the Bridge Street Bridge). 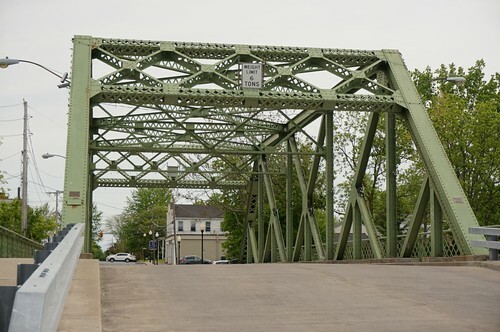 The bridge in the film certainly did bear a strong resemblance to this bridge. After leaving Seneca Falls, we continued on US 20 through Buffalo and along Lake Erie. 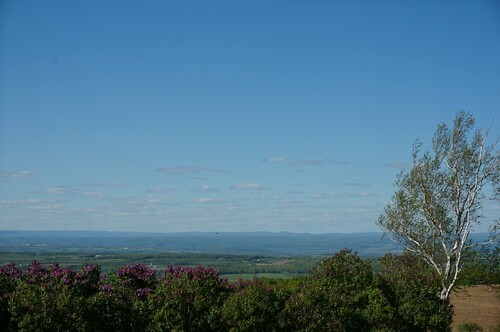 We knew that Erie, Pennsylvania was difficult to get a good, reasonably priced hotel room. 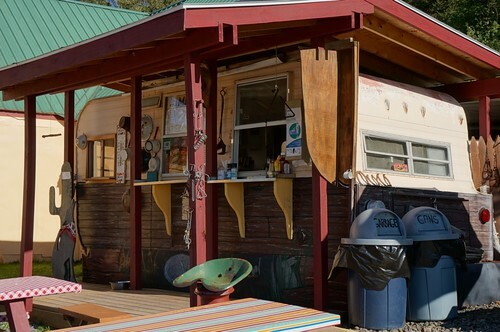 The better hotels are expensive and lesser hotels and motels with sketchy reviews still had pricey rates. We stumbled upon a little mom & pop east of Erie, but no one was to be found in the lobby! We followed the instructions to ring the phone (basically the base of a cordless phone that you press to ring the phone). Despite many rings, no one came. A guest who “sort of” checked in was just as confused. He was able to find a check in card and key, but no owner. They weren’t sure if they followed the right process, but at least they did have a key and room. The husband went over to the local bar / restaurant across the street, but no one knew where the owner was. The clock on the desk indicated they would return at 9, but it was a long time away, so we decided to move on. Just down the road, we found another mom & pop called the Colonial Motel in North East, Pennsylvania, and it looked very clean, so we decided to stay. It was reasonably priced and had good wifi. Winner! 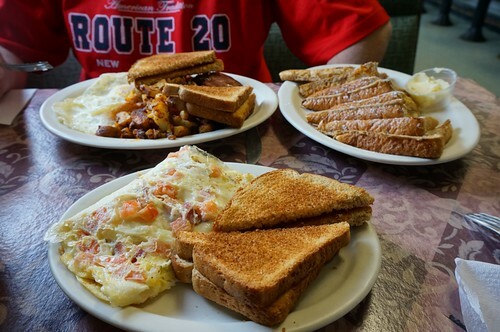 After a good dinner, it was back to the motel. Tomorrow was our last day and we’d be heading home. Below is a slideshow of all of today’s photos. 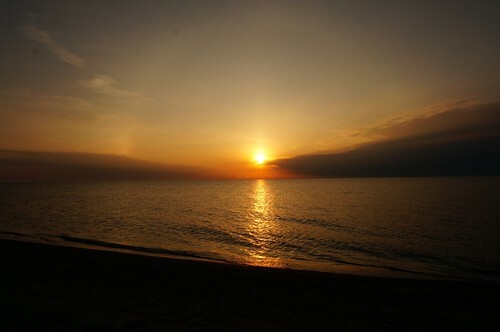 We were initially thinking of spending an additional day in Lake George, but considering the peak tourist season didn’t start for another week and very little was open, we decided to plan on coming back another time in season. After checking out of the motel, we did a little exploration of the site of the former Gaslight Village Amusement park, comparing some areas of the site to old photos we found on the Internet. I don’t remember much about the place, except the Cavalcade of Cars was a very cool exhibit featuring one of my favorite custom cars, the Munster Koach. The site seemed fairly small to house an amusement park, I’m used to the very sprawling grounds of Six Flags Great Adventure in New Jersey. Afterward, we decided to play a round of miniature golf, and Goony Golf happened to be open. Pat did very well beating me this time! 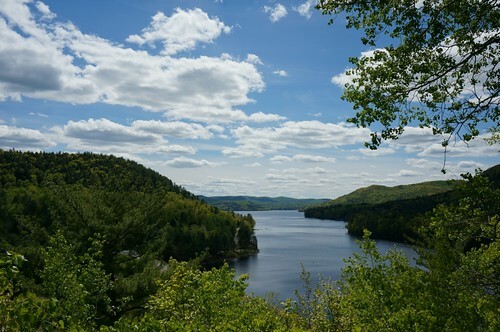 We then headed southwest out of Lake George on State Road 9, and in Lake Luzerne, picked up a local road that followed along first the Sacandaga River, then the shore of the Great Sacandaga Lake. Very nice ride on twisty roads, and such great views. We continued southwesterly on a couple of other state roads until we picked up US 20 near Cherry Valley. 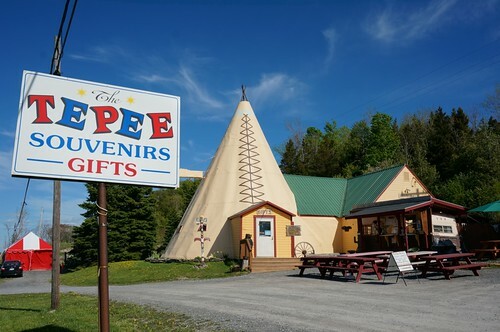 At this point, I knew we would be near another must stop recommended by my coworker Tina, that would be the TePee, a souvenir shop overlooking Cherry Valley on US 20. Pete’s view from the kitchen is beautiful! We continued on US 20 west for a bit, then decided to spend the night in Richfield Springs. 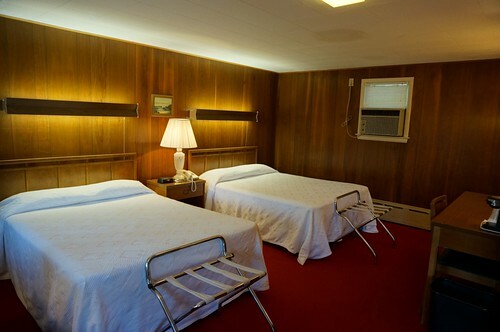 There were a few mom & pop motels in town, which all had reasonable reviews from Trip Advisor. We opted for the Fountain View Motel. We pretty much stepped out of 2013 and back into the 50’s & 60’s again, but the place was very clean. It wasn’t too late, and we had passed a place called Tunnicliff Creamery that was still open just a short distance back, so after we settled in, we decided to go get some ice cream. I think we may have had ice cream almost every day on this trip so far! 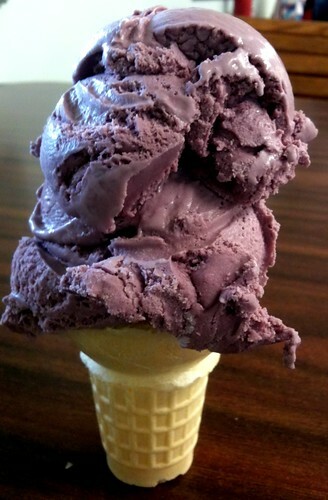 Here’s the black raspberry. We checked out the town a little (pretty small, so it didn’t take long), then went back to the motel to get some sleep.